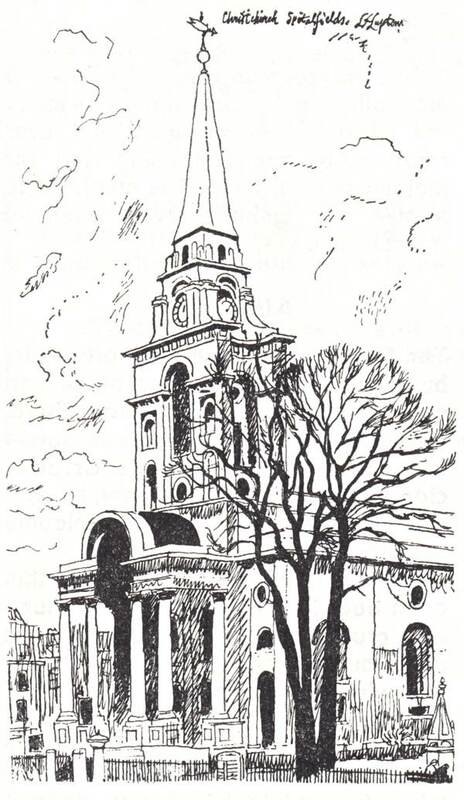 In the spring of 1968, artist Lewis Frederick Lupton came to Spitalfields and submitted this illustrated report on his visit to the Christ Church Spitalfields Crypt Newsletter. 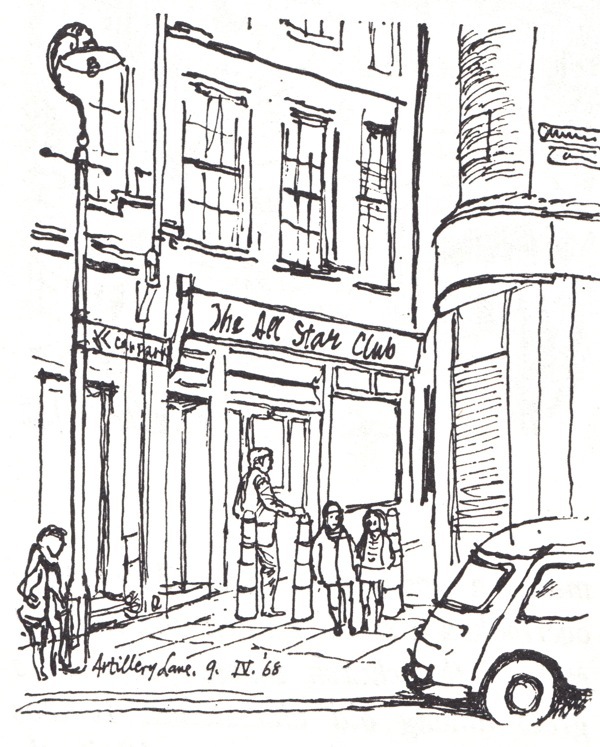 On Ash Wednesday 1968, I set off at eleven for Spitalfields to see the Rev. Dennis Downham about his work among alcoholic vagrants. 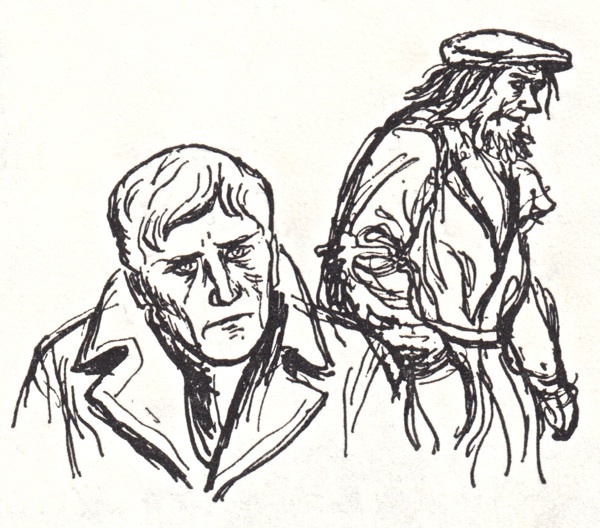 Walking up the road from the Underground Station, I saw a man very poorly dressed, his face a pearly white, obviously ill. Then came a tramp, as lean, dirty, unkempt, bearded and ragged as any I have seen. This was a district where there was real poverty. The Rectory was a substantial Georgian house such as one sees in many a country village. 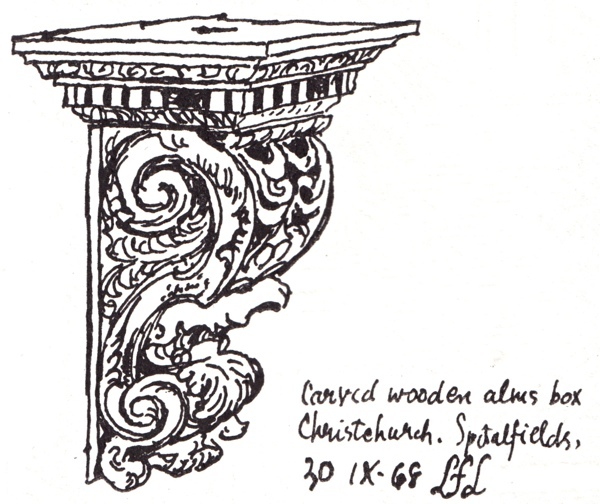 The study overlooked a small garden and the east end of the church, where plane trees grew among old tombstones. After lunch, we went out to see something of the parish. The first person we encountered was a fine-looking young American in search of his ancestors, who asked for the parish registers. 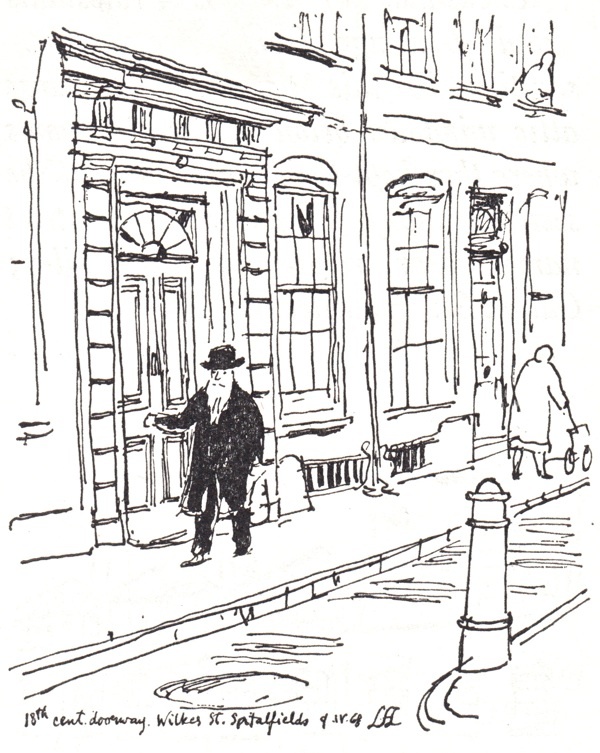 After directing him to County Hall, we crossed over into a narrow street between tall old brick houses with carved and moulded eighteenth century doorways. Out of one of these popped a little Jewish man with a white beard, black hat and coat. Round the corner in Hanbury St, the Rector unlocked (“You have to be careful about locks here”) the door of a building in which the church now worships ( “Christ Church itself needs a lot spending in restoration before it can be used again”). 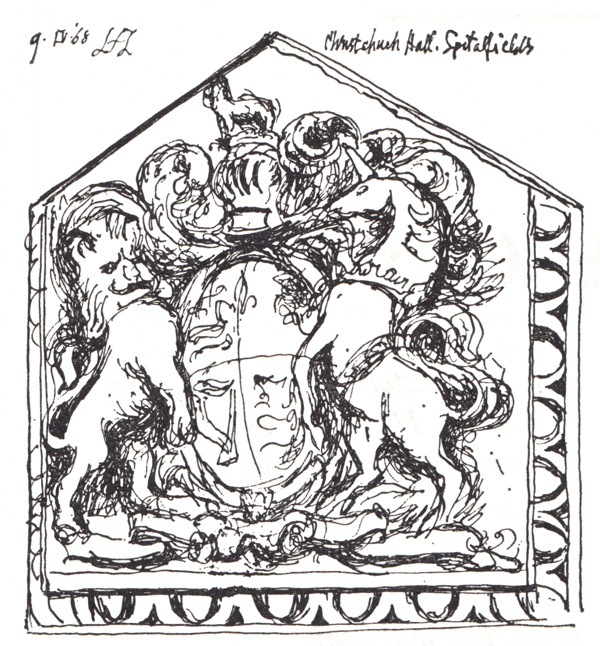 The building now employed once belonged to a Huguenot church, of which there were seven in the parish, and still has the coat of arms granted by Elizabeth I carved above the communion table. 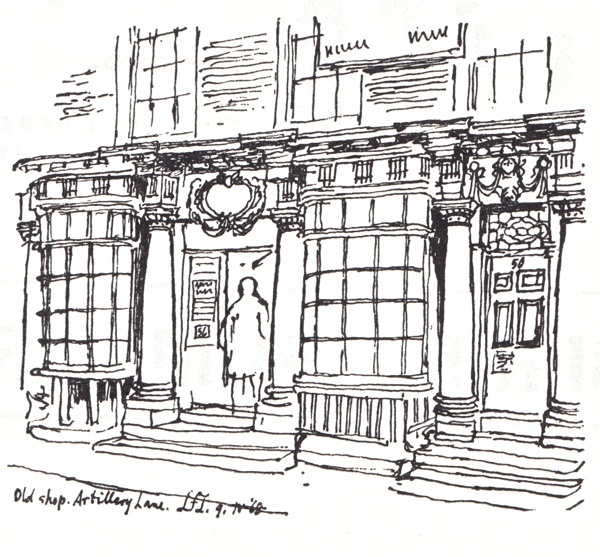 Crossing Commercial St, we came across a charming seventeenth century shop in a good state of preservation. Its fresh paint made it stand out like a jewel from the surrounding drabness. A stone’s throw further on, photographs pasted in a window advertised the attractions of one of the many night clubs in the area. 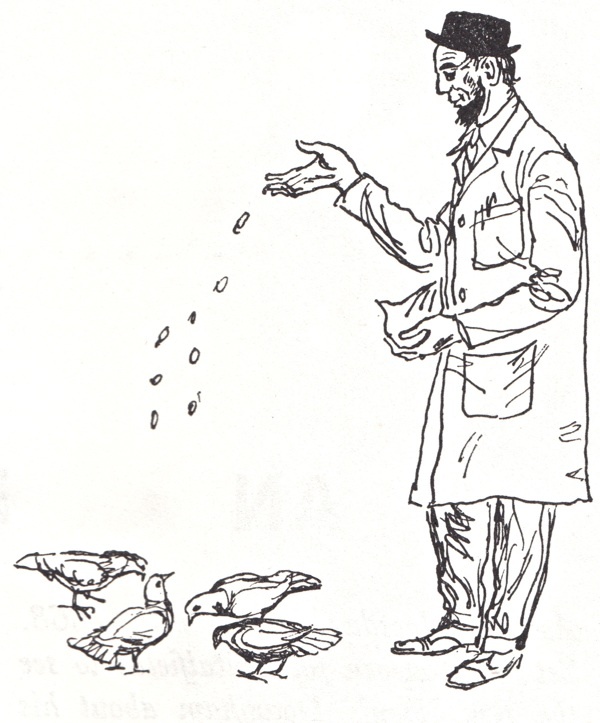 Opposite a kosher chicken shop, one of a the staff – a Jewish man with a beard, black hat and white coat was throwing pieces of bread to the pigeons. 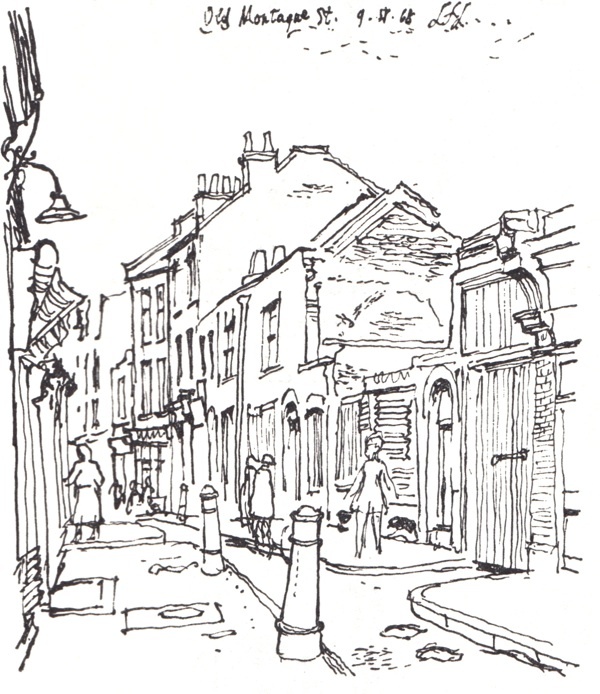 Round the corner, we plunged into an offshoot of the famous Petticoat Lane which forms the western boundary of Spitalfields. 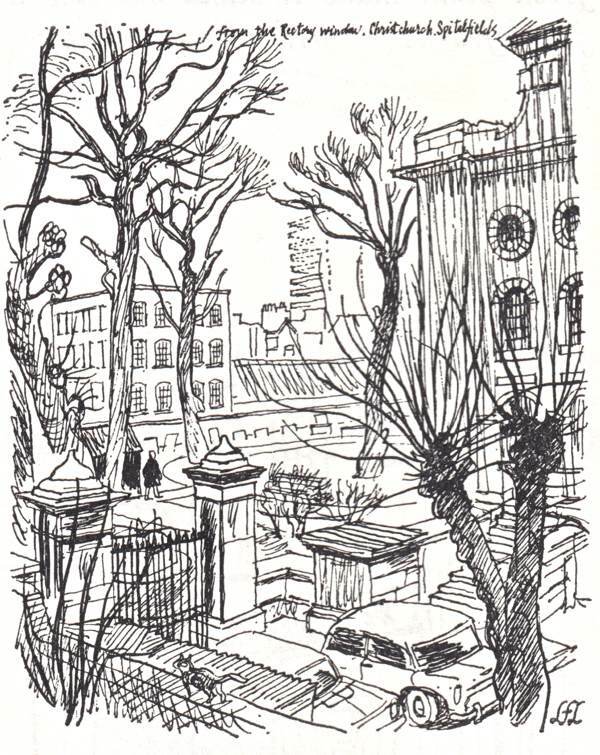 Turning eastwards, we tramped along the broken pavements of a narrow lane running through the heart of the district. It seemed to contain the undiluted essence of the parish in its fullest flavour, a mixture of food shops, warehouses, prison-like blocks of flats, derelict houses and bomb-sites. “There are twenty-five thousand people living in my parish. 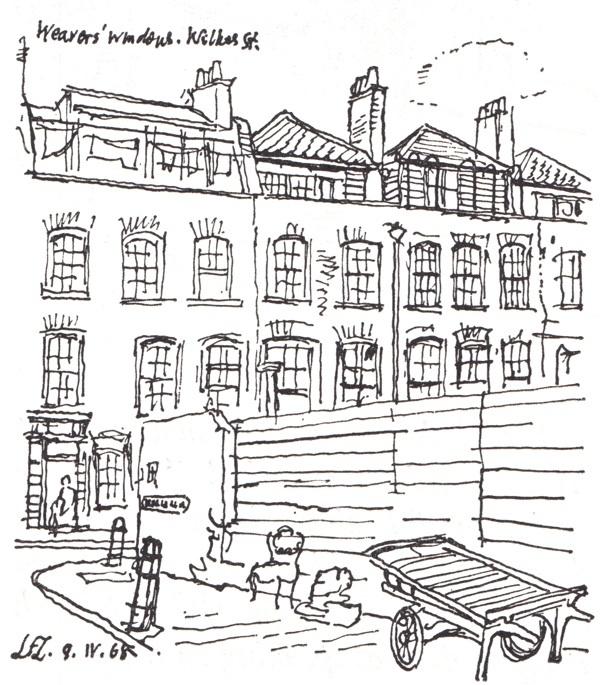 It is the only borough in central London which has residential life of its own,” revealed the Rector. Christ Church stands out like a temple of light in the surrounding squalor. Designed by Nicholas Hawksmoor, its scale is much larger than life and the newly-gilded weathervane is as high as the Monument. “I climbed up the ladders to the top last year when steeplejacks were at work upon it,” commented the Rector. Were it not for the brave work which has been begun in the cellars, the building would only be a proud symbol of the Faith, no more. 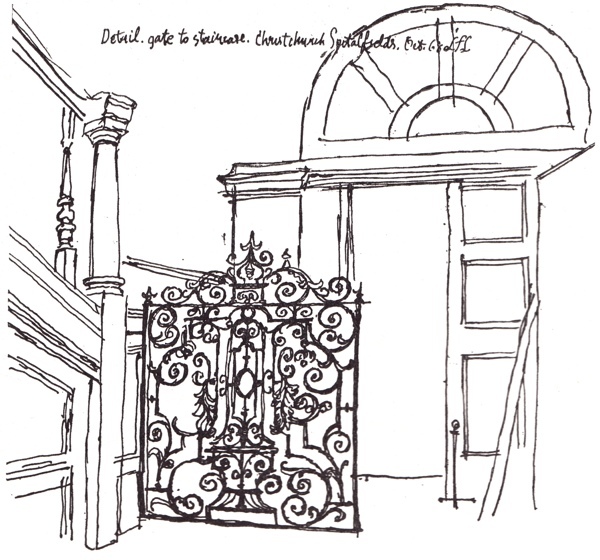 Down the steps, to the left of the porch, there is a reception area with an office and a clothes store. One sleeping fellow had a tough expression. 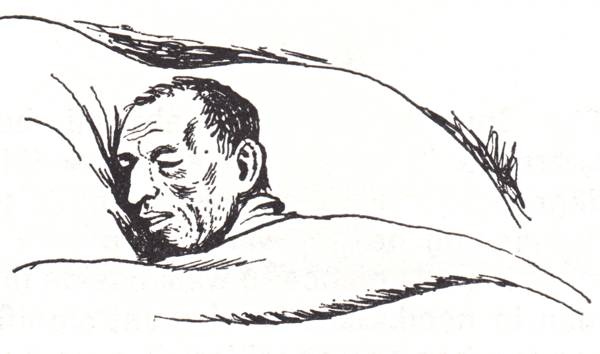 “False nose,” said the Rector, “he had his real one bitten off in a fight.” The central area is devoted to the work for which the crypt was opened. Except for a billiard table, it is like a hospital ward, mainly taken up with beds on which the patients rest and sleep. 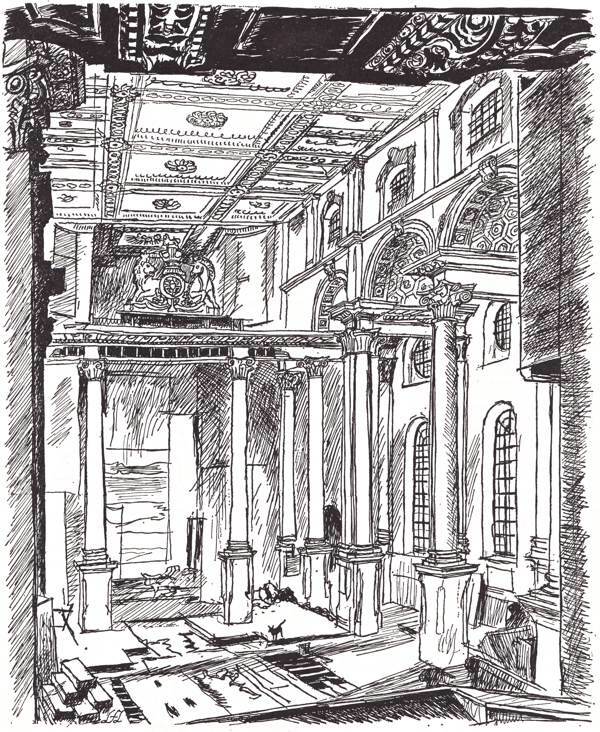 Yet, a crypt is crypt and the lack of daylight is a handicap but, with air-conditioning throughout, spotless cleanliness and a colour scheme of cream and turqoise blue, the cellars of Christ Church have been turned into a refuge which offers help and hope to those of the homeless alcoholics who have a desire to be rescued from their predicament. – L.F.L. What a charmingly whimsical historical document. If document is the right term for a source combining writing and drawing. It is also good to know the interior of the church is now restored to its former glory. Beautiful. I must visit on my next trip home. I enjoyed this GA. The drawings and the text are equally good and bring the scene to life for me as otherwise all of this is an unknown world, thank you. Today the Church has been restored and the Crypt now houses a nice café quite the change from 1968. thank you for this retrospective.